Most homeowners think foundation problems only occur to their houses. In reality, garages can also suffer from foundation issues. In Omaha, NE, many homeowners require foundation repair for cracked concrete slab, foundation settlement, and shifting foundations in garages. Attached garages can affect the home as well. For your garage foundation problems, contact Jerry's Waterproofing today. Wall cracks: Cracks can be present above doors and window due to soil pressure against the foundation. Floor cracks: Cracks on the garage floor are caused by settling or sinking foundations. Uneven or sloped floors: The concrete slab in garages can become sloped or uneven due to settlement. This is caused by voids and gaps underneath the foundation. Bowing or leaning walls: Bowing or leaning garage walls indicate uneven settlement. This can be caused by inconsistent moisture levels in the soil, soil compaction, or soil shrinkage. Misaligned windows: Misaligned garage windows are difficult to open and shut. This is an indication of settlement due to poor drainage conditions or soil expansion. Gaps and spaces between walls and floor, or between walls and doors/windows: This is caused by pressure against the foundation. Opening and closing garage doors may become difficult. Foundation issues are caused by inconsistent moisture levels in the soil and fluctuating weather conditions. Due to excessive rainfall, the soil absorbs too much water and expands. This creates pressure against the foundation walls, forming cracks and bowing walls. Saturated soil can also cause soil erosion, washing away the soil and creating voids under the foundation. Not enough water can also play a factor for foundation problems in your garage. Dry, hot conditions can dehydrate the soil under the foundation, causing the soil to shrink over time. 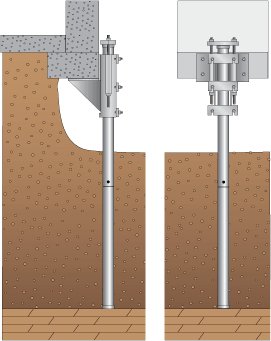 Steel push piers and helical piers are designed to restore your property's value by lifting the foundation back to its original position. They have a fast, quick installation process that is generally faster than other methods. Our products are made by Earth Contact Products (ECP), the leading manufacturer in underpinning, providing us with the latest products on the market. 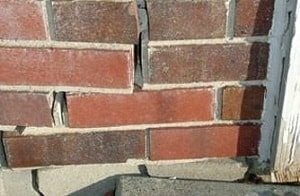 Contact Jerry's Waterproofing today for professional foundation repair solutions in Omaha, NE. For more information or a free estimate, give us a call. Our experts will determine the best method for your needs.